Minipips has left the building. I've started a new blog for my boy's exploits. 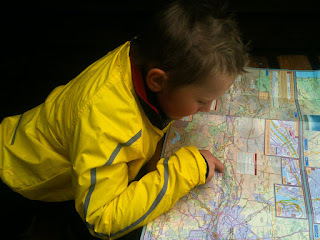 He's being telling his mates at school about his adventures and pointing them to this blog. Whilst of course this blog is not full of F this or that, I'd like to feel free to be adult here should I wish. More running and cycling stuff here in the New Year. 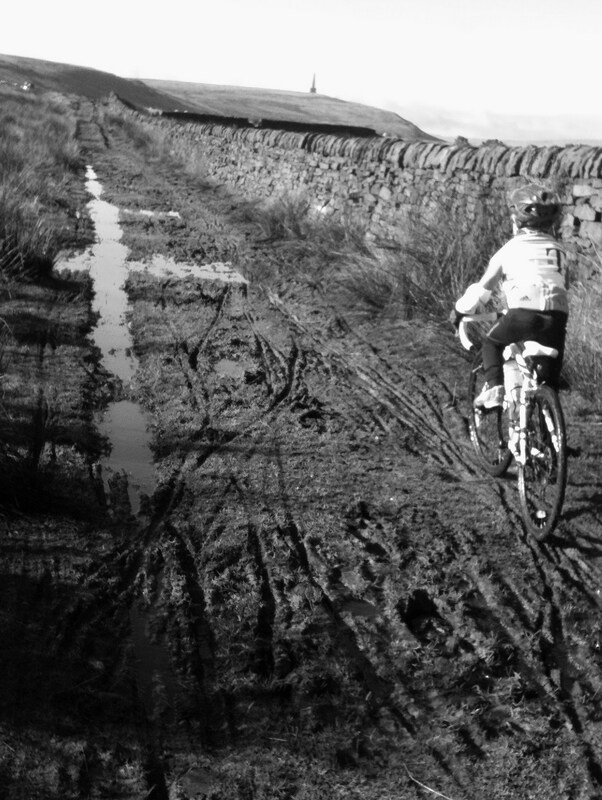 Unfinished business in the Three Peaks Cyclocross and possibly another winter BG attempt next year. My boy and I have got some good stuff planned over the Xmas period and some maybe ambitious stuff over the summer. It'll be child friendly, so even if it's not your bag, please feel free to send your kids over there. 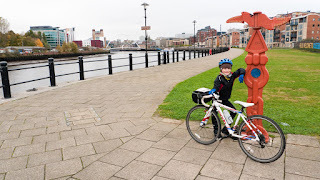 Minipips and his Dad's Cycling Adventures Blog. 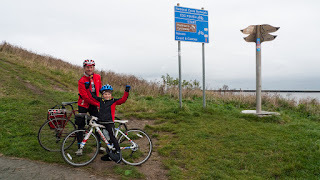 Hadrian's Cycleway - A Coast to Coast to Coast trip. 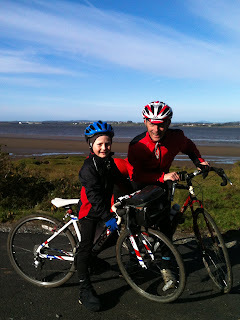 5:30 we left Hayfield on the Saturday morning, with a planned start of cycling from Bowness on Solway at 8am. Things did not go according to plan. Somewhere between junctions 39 and 40 on the M6, and we have a flat tyre. I go to change the tyre, to a) shear the bolt holding the spare under the rear of the car, and b) to find the spare tyre flat. So I ring the AA and am told my membership has just expired. A few more phonecalls and a recovery vehicle is on its way. An hour or so later the spare is reinflated, and we are on our way. Yay! Shortlived was our relief, because as we turned off for Carlisle, I could feel the spare tyre was now also flat. We were having some luck though, as we drew to a halt only a few yards from an ATS tyre place. By the time they had fitted a new tyre any hopes of an early start had long gone. We arrived in Bowness on Solway the start of Hadrian's Cycleway just before 11am. A quick change into our cycling clothes, a photo, and at 11:04 we were off. The temperature was just the right side of freezing, and the wind was at our backs. Our day was getting better. The route was all but flat until Warwick Bridge which meant good progress. At Brampton we had to make a decision. Should we camp there, or push on to Haltwhistle. The only factor being would we get there before dark. Mental arithmetic decided that if we didn't stop, then we should make Haltwhistle at dusk. The only lights we had were flashing LEDs which would ensure we wouldn't get run over, but wouldn't be much use for seeing where we were going in the dark. As we rolled into Haltwhistle darkness had all but fallen. It must be nearly 20 years since I've camped at Haltwhistle, and finding the campsite I'd stayed at before didn't prove too easy. We did find a sign for a different campsite, and this we followed up a steep hill in the darkness, and now falling rain. A mile or so out of Haltwhistle we arrive at Herding Hill Farm Campsite. The owner kindly offered a deal on a night in a heated pod which meant putting up the tent was not a consideration. The other ace thing about this campsite was that they did great pizzas, and draft beer too. We'll stay there again. Proper Northumbrian rain was forecast, and the forecast was true. I didn't know for sure where we'd encouter hot food enroute, so we waited for the campsite to open for a proper hot breakfast. The next section of the route is definitely the most beautiful, and the rain did little to take away from it. After an hour and a half we reached the high point of the route. After which the rain lessened and it was mostly downhill for a late lunch in Corbridge. Then a trundle to our campsite at Ovingham. A word of warning, don't expect an evening meal in a pub in either Ovingham or Wylam on a Sunday night in late October. We ended up having to ride into Prudhoe to a find a chippy. Only 23 miles now to Tynemouth we wrapped up well, it was a chilly morning. 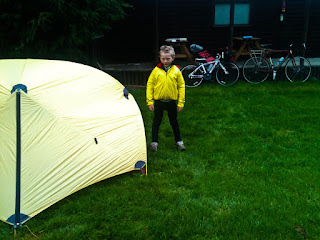 We left our tent at the campsite as we would comeback later that evening on our return journey. Not much to report about this section of the route, except to say that the signposting is excellent and it follows the course of the Tyne to Newcastle and beyond. We did like the Cycle Hub Cafe in Newcastle so much that we stopped for a late breakfast there on the way, and for lunch on the way back. Near enough 48 hours after leaving the Solway we arrived at Tynemouth. A leisurely ride back to the campsite therafter, stopping for a pint of the aptly named "Coast to Coast" on the way. The forecast for what might have been day 5 was looking atrocious, heavy rain and winds. We made the decision that we would try and get back to Bowness on Solway in one push. 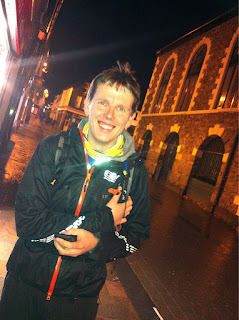 Tom had been completely unfazed by the mileage we'd done each day so far, so I reckoned it was possible. As with day 1 the impetus was to be could we make it before nightfall. Tom had been instructed to press the snooze button on my alarm at 6:15. He instead turned the alarm off. 7:30, later than hoped we were on the road. Flapjack fuelled us to Hexham, where we had hot food and drinks at a buttie van. 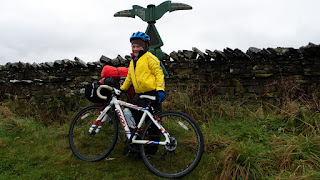 Tom "riding like he stole it" asked for cake in Haltwhistle, so we bought a big lemon and lime cake, and ate it all. A picture by Hadrian's Wall a must. Coke, chocolate and mince pies in Brampton and we are still looking good for finishing in daylight. A couple of hours later we drop down to the Solway just as dusk is falling. 30 hours after leaving Tynemouth. Tom was very pleased he had beaten his own record by 18 hours. 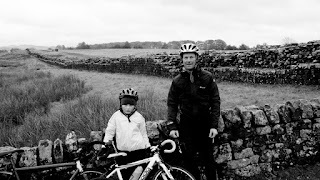 You might suppose Tom at the age of 7 after 75 miles in the saddle that day would be tired. Yet at 10:30 after his supper and a couple of drinks in the Hope and Anchor at Port Carlisle, he still did not want to go to bed. "Where are we going next daddy?" 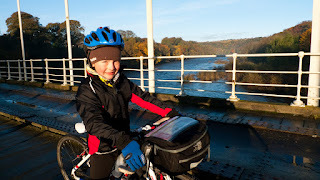 "Bowness to Tynemouth and back again. 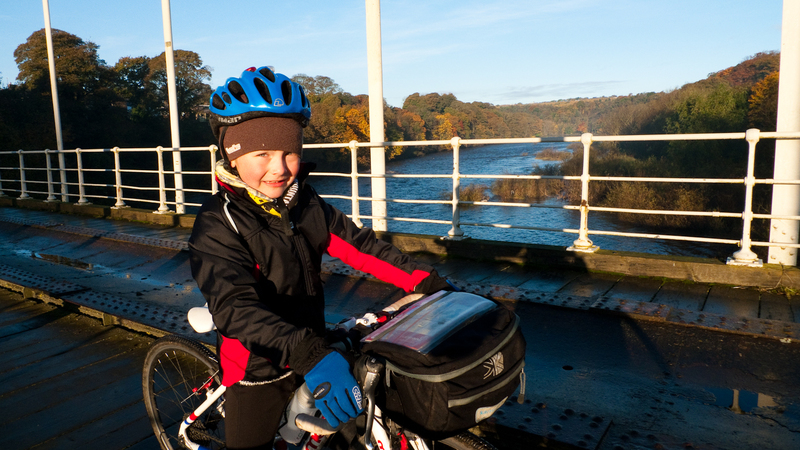 Father, Richard and son Tom age 7, recently completed the 200 mile round trip in late October. WELL DONE - Tom is the youngest to achieve this". Lately, it's been all change on the weekend excercise front for me. Rarely now do I get to race, or head out on my own into the hills. My enthusiasm has not waned, but my son's enthusiasm for getting out on his bike now matches (and some times surpasses) mine. 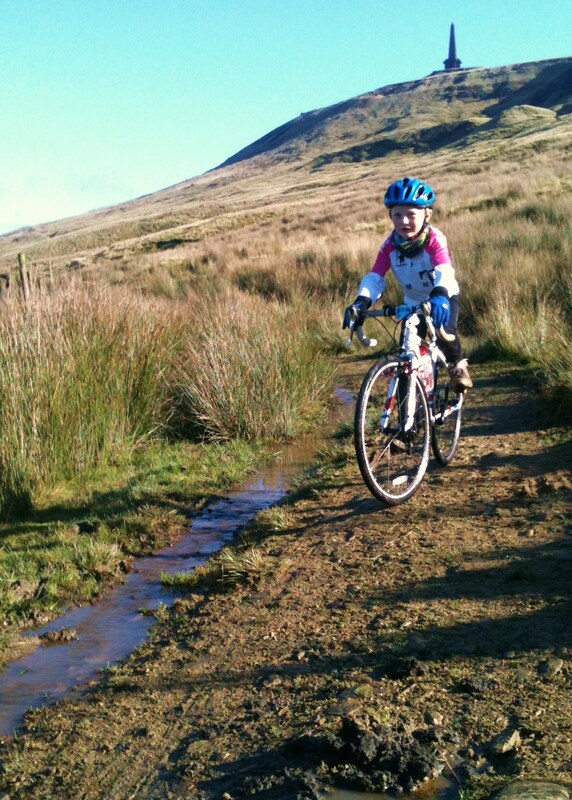 I've been fairly laissez faire about getting my kids into running or cycling. They've got fell shoes, and half decent bikes, but I've never pushed either of them, and in fact my eldest is currently happiest sat on the settee watching CBBC for the time being. Happy kid equals happy me. Recently though, my lad has become really keen on riding bikes. 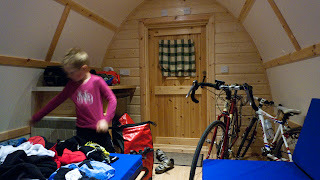 His enthusiasm is such, that after much pestering I have bought him a Moda Minor cyclo-cross bike. 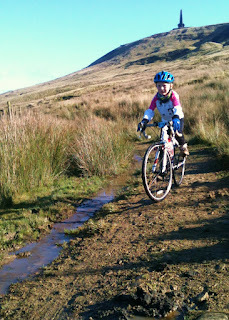 A cross bike is loads better than a mountain bike for doing road miles, and it's what his daddy rides near all the time. Plus remember if you have a nice bike, then your kid is going to want one too. 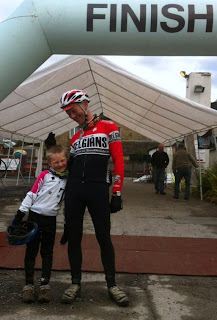 So yesterday we entered our first Sportive together. 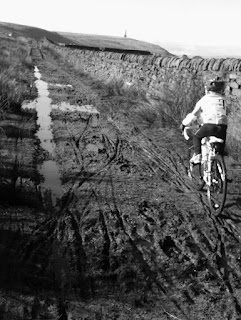 The Mills Hills cyclo-cross variant starting in Mytholmroyd looping Studley Pike, visiting Heptonstall, and Hebden Bridge more than once. 35 miles and 5000' of steep ups and down. We had a couple of tearful moments, one after a crash on the loose rocks on Gorple Road, the other when a farm dog jumped out and knocked him off his bike. Otherwise, in his words (like the last time he went for a ride) "today has been the best day ever"
I can't ask for more than that can I. 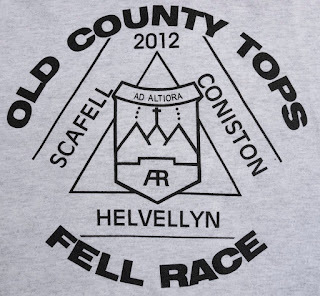 The Old County Tops is a 37 mile race with 10,000' feet of climbing that visits the summits of Helvellyn, Scafell Pike and Coniston Old Man, the highest points in the former counties of Westmorland, Cumberland and Lancashire. It is a team event where you compete in pairs. My partner Hanno who after talking to Paul a fellow pacer on my winter BG attempt, convinced me that we as a team should give it a go. After only a couple of beers the night before, and a poor night's sleep, we awoke to Lakeland drizzle in Langdale. 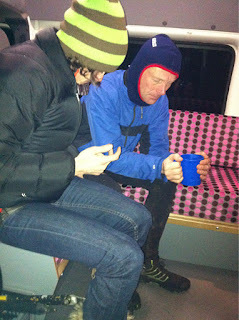 A hasty breakfast, last minute equipment choice, race registration, and we were off on our way towards Helvellyn. Worried by my dodgy knee I set a pace that can only be decribed as steady. Our game plan was to get to the first checkpoint at the foot of Helvellyn feeling fresh, and we achieved that. We even had time for Hanno to call in at a shop in Grasmere enroute. Hanno was a little concerned that as we climbed up Wythburn we could see very few people behind us. 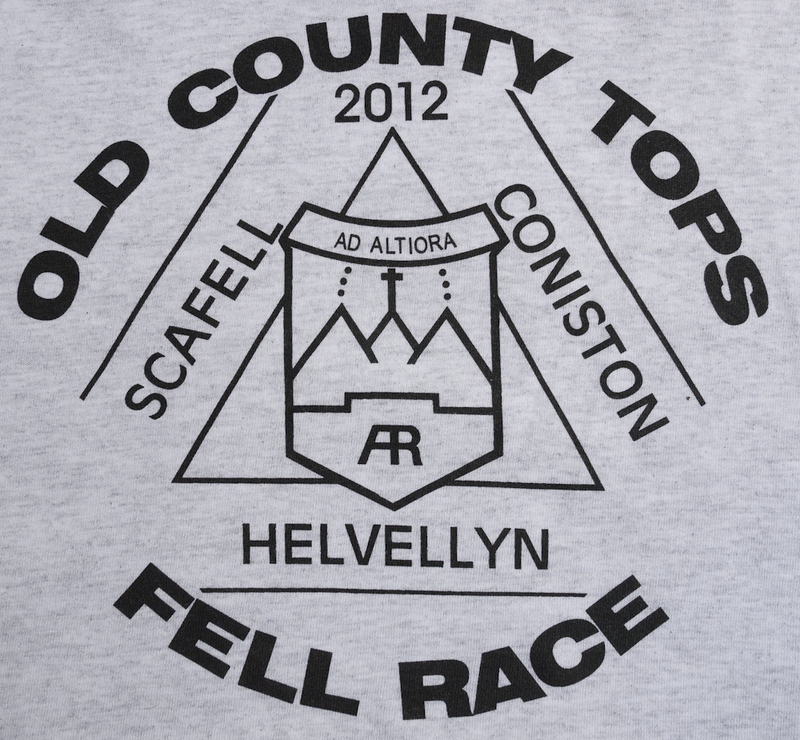 Not where we are used to being in a fell race for sure, but this is not an ordinary fell race. At Angle Tarn we were 25 minutes within the cut off time. All good I thought. I'd heard that if you had time in hand at Angle Tarn, then the next checkpoint at Cockley Bridge was near a given as long as you kept a similar pace. After getting down the tricky direct descent of Scafell Pike, I did some quick calculations, and realised that we were not guaranteed making the next cut unless we really got a move on. For Hanno this was news that didn't come at the right time as he was feeling a bit rough. But nevertheless we both dug in and upped the pace to make Cockley Bridge with a mere 8 minutes in hand. 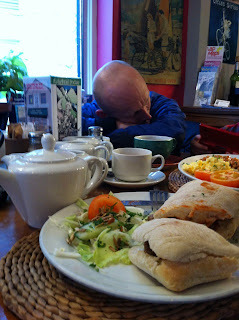 Lots of tea cake and sandwiches were consumed there, before the last big climb towards Coniston Old Man. Spirits lifted as we now knew that we would get round, and one each of the Old County Tops finishers T-Shirts would be ours. It was then that I sort of switched off thinking about exactly where we were going. Hanno asked if "that was Coniston Old Man" to which I replied without thinking, "Yes". Thankfully we were still in the company of others who'd already got the T-Shirt, one of whom kindly informed us that the hill I'd decided was the Old Man was in fact Dow Crag. If I'd thought about it I actually knew that, but I'd given up thinking about much by then. Apparently the Dow Crag variant detour is a common error, and we met one of our lot who after admitted to going that way before he realised they were going the wrong way. After Coniston Old Man there was no longer any time pressure, and I was hoping for a trundle down the hill back to Langdale. However with about three miles to go Hanno decided we should move ourselves a little way up the results list. So we lengthened our stride and legged the last bit to the finish. This stretch now on our own, was the first time all day we actually had to get the map out to work out exactly where we were going. It was good to know we still had something in our legs after all those miles and hills. My knee held up though it certainly limited our speed on the descents. Thanks Hanno for your patience. Still, we had a fantastic day out on an amazing course which was extremely well organised by the Achille Ratti Climbing Club. We finshed somewhere very near the back of the field in an unofficial 11 hours and 6 minutes. Next year we'll be back. Somewhere nearer 9 hours hould be achievable, but whatever it'll be a great day out. It's a brutal little race Mount Famine. One that I wasn't quite feeling up to on the day, so instead I took my camera and tripod out and shot some video. Since my BG attempt my mileage has been much lower then the 40ish a week that I'd been doing pre BG. A couple of weeks of near total rest to allow my ITB to settle down, followed by a few weeks of 20-30 miles. No runs of any real length ie all under 8 miles. This I knew would not aggravate my knee, and indeed it has worked so far. 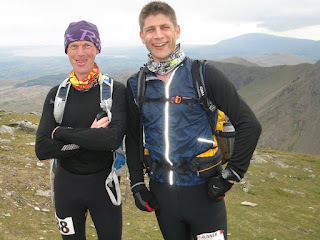 I have entered the 36 mile and 10,000' Old County Tops with a mate which is in just over two months time. So, I knew that sooner or later that I'd have to test out the knee. So, a last minute entry looking for a home via a mate for the 32 mile 4400' Haworth Hobble this weekend gone was taken. I could see from the map and a fair bit of previous over that way, that the Hobble was going to be a very different proposition to the BG or OCT. Lots of tracks, road and little to no off piste stuff. Not my usual, but an easy way of getting 30 miles under the belt or so I thought. 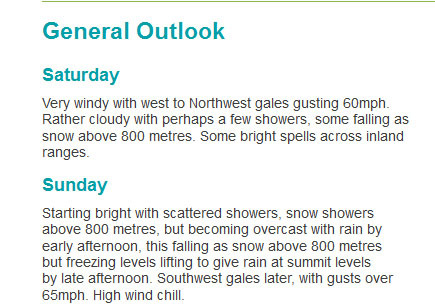 So Saturday 8am, and steady away out of Haworth I go. By mile 15 my GPS is showing an average speed of 5.5 miles an hour. That's nowt spectacular for most maybe, but loads faster than I'd normally run for ~3 hours. Sure enough payback was soon to follow as my pace slowed little by little. The most painful bits from there on being the flat tracks and road. Thoughts of getting round in under 6 hours, moved to getting round in under 7, and eventually to just finishing (in 7:18). I ate enough and drank plenty, so it wasn't a fuel issue. Not enough recent miles in the legs probably, plus no fast miles at all. The most important thing I take away from the day is that my knee didn't give me any trouble. So with a few more miles in the legs over the next couple of months, the Old County Tops should be an enjoyable day out. The Bob Graham round is 66 ish miles, 42 tops and 28'000. As day broke last Sunday morning, and I descended into Langdale I'd done 36 miles 22 tops and 14,000'. Saturday James kindly drove me up to the Lakes. 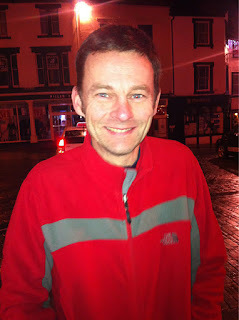 I was rested, fed, and generally feeling rather good about heading out on a mid winter Bob Graham round. We arrived just in time to have some supper in a local hostelry, but of course without beer. We'd maybe left it a little tight on time, so I had to be quick to get ready. But there was time for a quick leg massage form Ali before I headed for the Moot Hall. At the Moot Hall there were lots of people. Along with some of my helpers, and supporting runners were Dave Ward's team. Dave a fellow Pennine runner was setting off at the same time. We must have cut it fine, as apparently we had 3 minutes before our 8pm off. No time for nerves, just as I like it. Below Steve and Mark, a couple of my leg 2 pacers. Having not run for a week, I'd feared this first section, as I'd thought my legs would have forgotten how to run. A foundless fear, as one of my pacers said I was running too quickly, when I thought I was jogging. Dave's team were in sight for quite awhile as we headed up Skiddaw's lower flanks, but I made sure I wasn't going to chase them. We were making good progress and thankfully unlike the last two times I'd been up there, the wind was manageable. Skiddaw was summited with time in hand against schedule. Next a steady jog down into some very damp ground before the climb up to Great Calva. The exact line of the trod to the top proved elusive until we were a fair way up the hill. We weren't the only ones to take an alternative route to the top that evening. As I neared the top Dave's team rolled up a short distance behind. On the descent Dave's lot were away ahead of us. The River Calva when we reached it was a mellow calf height deep, and in seconds we were across it and on our way towards Mungrisedale Common, and then in turn to Blencathra, though this section seemed to take an eternity. Still, plenty of time in hand. On Blencathra a few dabs of snow reminded us that this was winter, even though the lack of wind rain and cold seemed to suggest otherwise. Playing safe we jogged down Doddick Fell. The wind that hadn't really been much of a nuisance briefly reminded me of its presence by whisking my HCtB winter hat from my head before dumping it somewhere near Scales Fell. Sadly I didn't have the time to go and look for it. Hmm a bit of a niggle in my right knee. Down at Threlkeld I ate, changed head torch batteries and had my legs massaged again. Leg 2 a trudge through bogs and tussocks to gain the slopes of Clough Head. A bit of wind, but not enough that we couldn't hold a conversation and be heard. Good progress through the occasional mist that came and went. Skirting Calfhow Pike we were soon on the Dodds ridge. As we picked them off in the distance we could see lights. Steve and Alan now joined us. On over the rest of the ridge towards Dollywagon Pike we kept close to schedule, but as we descended each hill my right knee started to hurt more and more. Years back I'd had some ITB (illiotibial band) problems, but throughout all my recent training had never had more than the tiniest twinge. Not impressed. Climbing Fairfield was painful, and descending even more so. By the top of Seat Sandal I'd lost a good chunk of time, and by the time I reached Dunmail to the sound of my crews cow bells a good chunk more. It's hard to describe the emotions I was feeling there, except to say I was definitely emotional. I felt strong, not tired and really wanted this. But my ITB was murdering me. Failure had never been a possibility until now. I was not going to chuck the towel in. Emma and Ali had tea and noodles for me which I devoured. 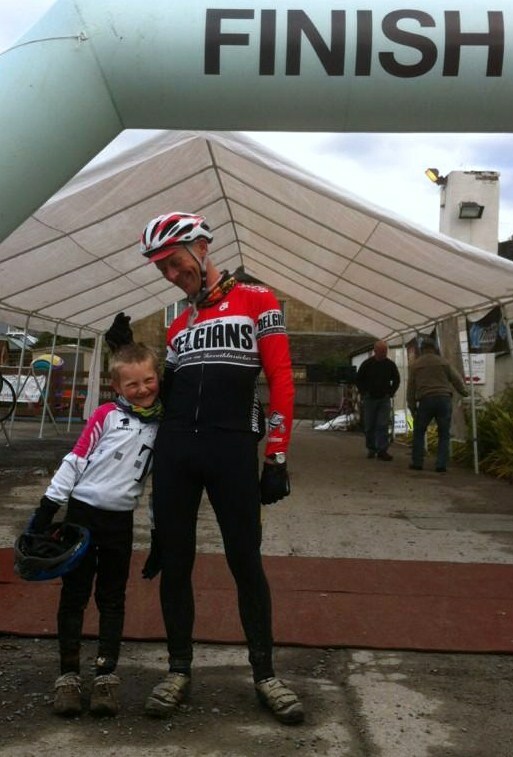 Ali again looked after my legs gave me a cuddle and Hey Presto I was ready for Leg 3. Dunmail to Wasdale was the leg I'd thought if I could get through then the rest would go. I was encouraged by Hanno thinking that the ascent of Steel Fell was a toughie. For me it was a steady effort, and a short one. The knee was not too painful after it's massage, but that didn't last for long. The next section should have been quick. I managed to run the few flat bits, but the ups and down were slow. Even though I'd been up here a few weeks back, without my GPS I wouldn't have had a clue as to where we were. Paul (now to be know asThe Seer) without map and compass however knew more or less excatly where we were. Most impressive. I got time checks as we attained each summit, and as I'd feared, was hemorrhaging time. Dawn broke accompanied by a chill wind, not giving the usual lifting of spirits that dawn brings. By Thunacar Knott, I was nearly 1:30 down on schedule. Ahead of me some of the biggest roughest climbs of the round. Not lightly, for sure, but the decision was made. Getting round in 24 hours was not going to happen. Paul made the call to James to let everyone else know what was happening. The drop down to Langdale if I was fit would have taken 15 minutes tops, on the day probably closer to an hour aided by my walking poles which I'd picked up at Dunmail to take the pressure of my knee. Down at the New Dungeon Ghyll we were greeted by Jenn with tea coffee, and gingerbread biscuits. Yeah. 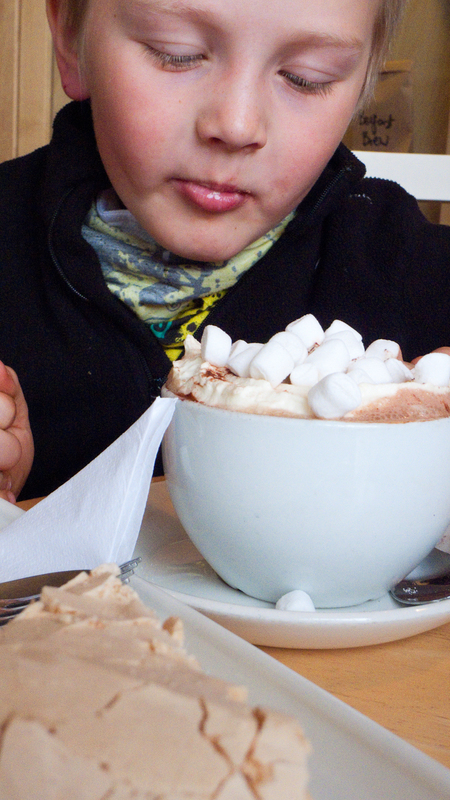 Some walkers commented on how gauche we were having tea and coffee before we set off on our walk. I said "Start? I've just finished, and started from Keswick". I don't think they believed me. Back at Keswick were Ann and the kids. It was great to see them. We adjourned to a cafe where Emma, Ali and James joined us for breakfast. I ate, chatted, and shortly after was struggling to stay awake. So, as I finish writing this a couple of days after the end, my current reflective thoughts. A winter round is a toughie. You have to love the night. I'd trained in the dark and being able to cover rough ground quickly by torchlight is essential. When I was not hobbling, I was on, or ahead of pace, so I feel that part of things was good. 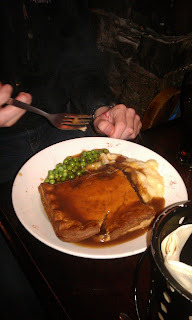 I ate reasonably well, and at one stage I probably ate a bit too much which my stomach didn't like. The logistics of the round went well. Having a number of helpers on the ground proved useful on a couple of occasions. I see no reason why I wouldn't have got round if my knee hadn't flared up. I am indebted to a number of people who haven't been named here, but they have been thanked in person. I certainly wouldn't have got as far as I did without them. Will there be another attempt at the round? Indeed there will. I'm going to find a nice day in the summer when my knee is fixed and do the round with some friends and have a few beers afterwards. Next Winter though I'll be back. The Lake District is a special place as you all know, but having it to yourself and a few mates in the dark is something else. Saturday Nights Alright For Fighting. Well a less than ideal forecast for an 8pm start on Saturday, but there you go. Other forecasts say that we start of windy, and as Saturday night continues the winds abate. 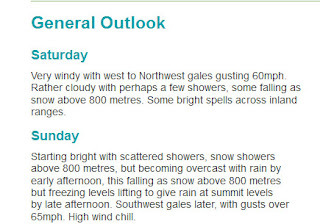 Sunday day is meant to be quite pleasant, before the winds, and hey some rain on Sunday night. Gear packed, some food to buy tomorrow. My training is now done and dusted for my winter Bob Graham round. I started keeping a training diary at the beginning of October 2011, and my totals to the end of December are 470 miles run with 114,805' of ascent and descent. That's not far off the usual recommendations of 40 miles a week and 10,000 of hills. I've never run so much over such a period of time, and as the weeks have gone by, I've found I've enjoyed running more and more. One thing is for sure, is that post BG I'll try and keep at it. Already I have my eye on some other longer events. A few days of rest now and weather permitting I'll be leaving the Moot Hall in Keswick at 8pm on the 6th of January.